this study aims to see a picture of personality in students having a GPA above 3:50 (in terms of the theory of five factor model). Subjects in the study amounted to 158 students who have a GPA above 3.50. Research subjects are divided according to personality, the personality of the group Openness to experience, conscientiousness, extraversion, agreeableness, and neuroticism. Research data collection is done by using a questionnaire drawn up based on binomial scale. these research data were analyzed using descriptive statistics with the help of SPSS version 13.0. The results showed that the dimension of experience Opennes to 0.619 the mean empirical, dimensions, Conscientiousness dimension of the mean empirical 0.642, Extraversion dimension of the mean empirical 3.614, Agreeableness dimension of the mean empirical 0598, the mean Neuroticism dimension empirical 0.600. fifth dimension on the live factors of personality type model has an average value that tends to be high. 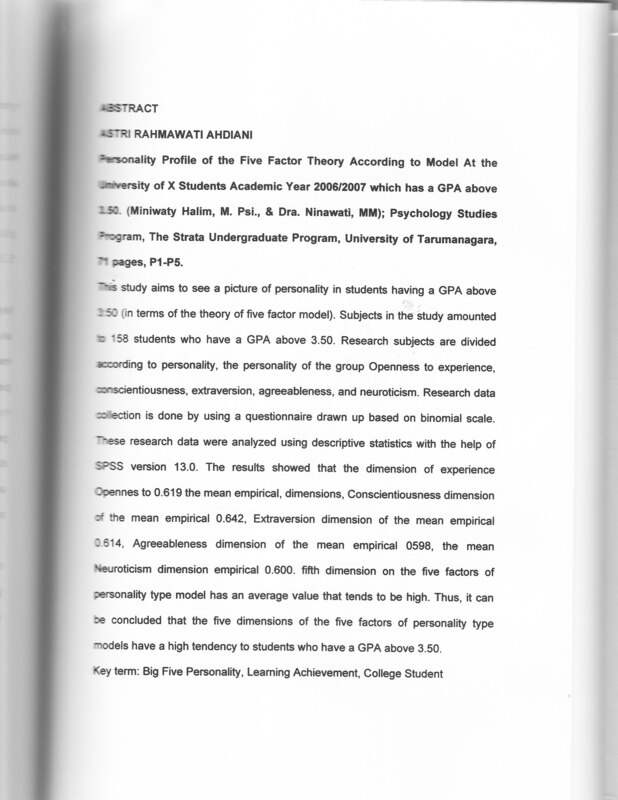 Thus, it can be concluded that the live dimensions of the five factors of personality type models have a high tendency to students who have a GPA above 3.50.